For most of my adult life, I’ve loathed Winter, or even the coming of it. Once the Equinox is passed, usually September 21st or so, I quickly start to feel the increase of darkness with each passing day. Couple that with some degree of seasonal affective disorder (SAD), and there’s the recipe for an emotional shitstorm nobody understands unless they share this wonderful malady. Oddly enough, all of this shows up in me most often as anxiety rather than depression. Well, of course, nothing is simple with me. Turns out, my particular version is actually called Seasonal Panic Disorder, which while less common is still nonetheless well documented. From my behind-the-eyeballs experience, and from what I’ve read, the purely SAD variant tends to be challenged with depression during the winter and often has bouts of anxiety in the summer. Seasonal Panic Disorder dishes up average plates of anxiety in the sunnier months, and a generous helping of anxiety at other times. It’s difficult to relate the feelings of anxiety, and yes sheer panic, that can accompany the daily setting of the sun, as it starts dimming by mid-afternoon. Compare it to feelings of fear, and you’ll begin to understand. So, in December, the yearnings of a sun worshipper, such as I, include an intense focus on December 21, the Winter Solstice. It’s the known bottom of the dark emotional hole, not just the terminus of the seemingly ever-expanding darkness. One day, getting up on December 22, can make a difference. The average “normal” person will find the change imperceptible. For me it’s like seeing a rescue boat on the horizon, as a gasp for one more breath of air and struggle to stay afloat long enough . . . .
Finding your passion. Embracing your passion. The word has been tossed about a lot in the last few years. Often, it’s been casually inserted because, well, it’s trendy and has some mysterious verbal appeal. But what is this thing called passion, really? I first came across the term years ago when I read a book by Tony Robbins. That was the first time I’d encountered the word being used outside a lustful context. And it resonated. The emotions embodied in its utterance reflected so many things I felt strongly about. I once heard the question, if money was of no concern, what would you do? That’s a good start to understanding passion. Here’s a few more questions to help you define, and discover your own, passions. What are you so motivated about that you don’t need an alarm clock to get at it? If you had six months to live, what would you do? What venture or activity puts a smile on your face just thinking about it? Your answers to those questions will illuminate what, for you, is your core passion. We all have our own core passion. The part of our life we’re emotionally and intellectually connected to that could be called “the reason we’re here.” But beyond that, there’s the whole rest of the world. All the events and people and places that make up the entirety of our lives. You went for walks passionately, noticing and embracing the beauty that’s all around you? Your life was more like that of a child, with an awe and wonder about your every experience, and joy (passion?) in every moment? 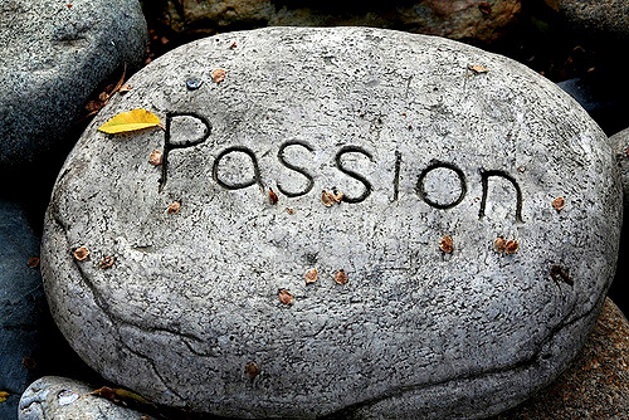 Even your trips to the grocery store were done with passion? Looking for the good, doing good and making a difference in the lives of those around you? Choosing to live passionately will not only change your own outlook. It will transform the world around you.